Walsine Pierce: I'M COMING: Put some clothes on! I'M COMING: Put some clothes on! As ususal I was up and had breakfast ready for Julie at 6:15AM. As Julie got ready for work I wrote a blog about my 78th birthday. Afterwards, I read my current novel, "Treasure of Khan" by Clive Cussler, and around 10AM I took a few minutes nap. Then, up and at'em to do yard work as planned. As I was getting out of the shower my phone rang. It was my friend Kathy Hatfield. She said, "I'm at your front door. Let me in". I replied "I've just stepped out of the shower". She said "Well, come let me in, uh, put some clothes on first". Its always the little words that puts the flys in the buttermilk, huh? She explained that she was here to take me to lunch for my birthday. How sweet! I don't know of anyone, other than family members, who has ever been so kind on my birthday. Another thing that has never happened. Kathy said Bob, her spouse, had given her the money to buy our lunch. I have no problem believing that a husband here or there may have given his wife money NOT to take me to lunch but never the other way around. You know what? I must be getting old. HA. On the way to Cracker Barrel my son Mark called to take me to lunch today. When told that he would have to get in line he said we'd do it later. My youngest son, Todd, replied to my morning blog as I was still working on it, wishing me a happy day. As we ate lunch my lovely daughter Kimberly called and she and her children sang happy birthday to me. She said "three voices in three differnet keys, Dad, but one sincere wish for you to have a happy birthday". My new grandson-in-law, Aaron--Dr. Vaughn--has sent me two birthday wishes by email. He is a dandy and a real addition to the family. 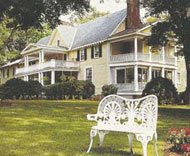 He and granddaughter Bethany may join us for dinner on Thanksgiving Day at Prospect Hill Plantation Inn. He is doing his internship at the nearby UofV Hospital. Being the "new kid on the block", so-to-speak, he probably won't get to come back to Ohio for the holiday. We look forward to this possibility. Julie said she would make Shrimp Devolo for me tonight but I said no. I don't want her to come home and cook dinner. We'll probably do Italian at a local eatery. At 4:30PM it has been a good day. I decided the novel needed me more than the yard--I am way ahead with the yard--and I've enjoyed a day of reading. It's been a good birthday! "Always remember, you are absolutely unique, just like everyone else"
Happy Birthday, Cousin Walt! I'm so glad to know you! I hope you had a wonderful day and I wish you a fantastic year ahead! God Bless you real good!!! OLDER THAN DIRT: Happy Birthday Walt! RIPPLES IN A POND: Who have we touched in life? AH, SPRING! Another Great Year A'coming. FRIENDS: A most priceless treasure. WALMART? Whats a wall mart? ANY PORT IN A STORM: Where to spend the night? UH, WHERE AM I? San Diego is a B I G city! IT IS DIFFERENT: But it is okay! UH OH: Still later in the day! UH OH: Later in the day. UH OH: The plumbing inside is old! A WONDEROUS EVENT: The blessing of the trike. A MEETING OF FRIENDS: Priceless!